I picked up an RN-XV from Sparkfun to see what it would do. I didn't read the docs before I ordered, and I expected to be reading and writing registers and building my own packets. However, I was almost disappointed to learn how much functionality is supported within and how easy it is to get working. The RN-XV is a carrier board for Roving Networks' RN-171 WiFi module. 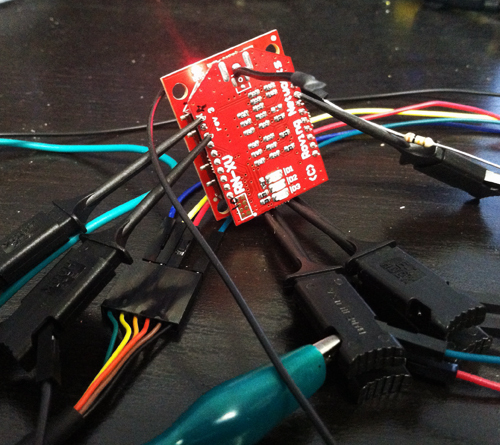 Since the XV is meant to be pin compatible with the Xbees which use an odd pin spacing, I also ordered an Xbee Explorer Regulated to make connections and power easy (the FTDI cables I have are logic 3.3v but 5v Vcc, so the regulator is needed). I plugged TX to Din, RX to Dout, added power, and BAM! Blinky lights! Unfortunately, it didn't respond to my serial input. After a bunch of tracing and reading, it turns out that the Xbee board does logic level shifting with diodes. The Xbees's have pullup resistors in their Din pins, however the RN modules do not. After adding a 10k resistor from Vcc to Din, I was able to link it to my network and ping things first try.